12.02: Gilby Clarke joined Guns N’ Roses on this day in 1991, replacing founding member and original guitarist Izzy Stradlin, who’d left suddenly after a show in Germany, citing Axl’s erratic behavior and Slash, Matt Sorum, and Duff McKagan’s drug use (Izzy’d recently found sobriety) as the main reasons for his departure. Long way of saying that Gilby Clarke took control of Guns’ rhythm, along with Sorum, and lasted all of three years, an eternity in Guns N’ Roses universe. Izzy’s departure came on the heels of original drummer Steven Adler’s firing and led the way for the rest of the band, except for Axl, of course, to eventually take off. Guns N’ Roses lives on in name, but the spirit indelibly existed for only a short time, from 1986 to 1993. R.I.P. Guns N’ Roses. 12.04: This day in 1993 claimed the life of one of the greatest composers in history, the one and only Frank Zappa. Some, namely those who don’t know his works, might scratch their collective, uneducated heads at the “composer” categorization, but we know differently. Only 52 years old at the time of his death (from prostate cancer), Zappa released more than 60(!) albums in his life, most with his band, Mothers of Invention. 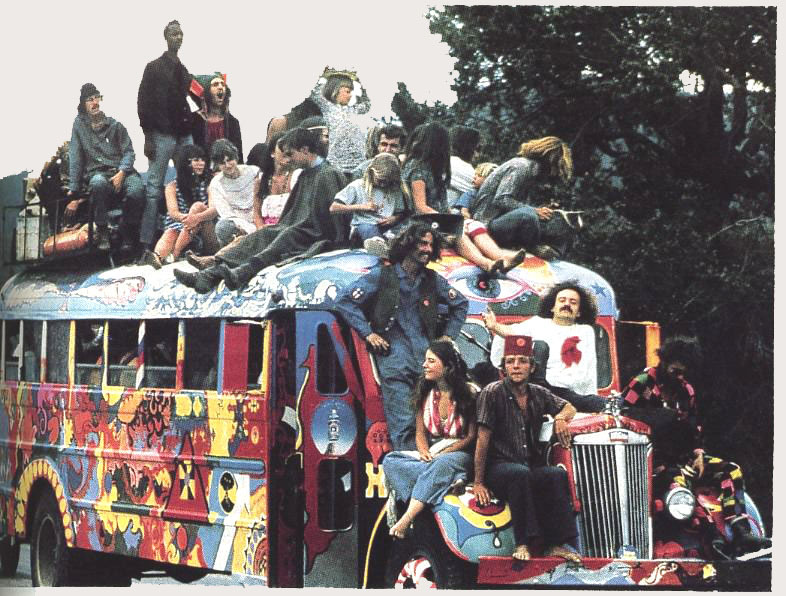 A student of contemporary classical composers, such as Varése and Stravinsky, and the popular music he grew up on, such as doo-wop and early rock ‘n’ roll, Zappa turned his overarching love of all music into something else entirely, a beautiful mash-up of things he loved, presented in complex and challenging styles. We could go on for thousands of words, expounding upon the virtues of exploring Zappa’s work, but we shan’t. We’ll just say check him out for yourself. Pick an album, any album, and listen. 12.06: The writer of such hits as “Pretty Woman,” “Only The Lonely,” and “Cryin’,” Roy Orbison, passed away from a heart attack on this day in 1988. From his initial success in the late ’50s and early ’60s to his popular decline through the ’70s to his resurgence in the ’80s, Orbison’s career spanned four decades, from the early days of rock ‘n’ roll onward. His uncannily, almost impossibly smooth tenor accompanied his rock ballads to the top of the charts, influencing some of the great bands of the ’60s, like The Rolling Stones and The Beatles, with whom he toured in Europe in 1963. His friendship with George Harrison lasted the rest of his life, as George would join Orbison, Jeff Lynne, Tom Petty, and Bob Dylan in Traveling Wilburys, one of the greatest supergroups in the history of supergroups (quick, name another), thanks in no small part to Orbison’s contributions, which, like most of his work, was flat-out brilliant. It’s been twenty-five years since his death, but if you watch the filmed 1987 concert movie Roy Orbison and Friends, A Black and White Night, you’ll swear he’s still here, his voice resonating through your brain like the morning sun through your bleary eyes. 12.07: On this day in 1949, one of the most distinct voices in music came to be, when legendary rocker Tom Waits was born. His smoky growl leaves many people covering their ears, ready to bolt for the nearest exit, but the admiration heaped upon him by his fans, musicians and regular folk alike, knows no bounds. Despite his voice or, rather, because of his voice and his immense appetite for trying on new musical approaches, Waits has accumulated a massive cult following around the world, eager to listen to new works alongside his established classics. Changing his style over the years, incorporating unusual instruments and difficult arrangements (at least, for a musician lumped into the rock cannon), Waits’ albums run the gamut from the gorgeous piano and string affairs of his early work to the avant-rebirth of Swordfishtrombones to the gaunt and stripped down Real Gone. A genuine one-of-a-kind in a world of sound-alikes and mainstream trash, Tom Waits continues, as he’s done for nearly forty years, to be his own man, and for that we love him, waiting with bated breath to see what he comes up with next. 12.08: James Douglas Morrison was born on this day in 1943. Known forever and ever by his nom de plume, Jim, he would fly to the heights of stardom in the ’60s as the frontman of quirky little L.A. band called The Doors. His early days as a military brat informed his journeyman ways, moving across country, from school to school, experiencing many different sides of America. He told of an incident that supposedly occurred when he was four, of which his father and sister disputed the facts, when his family crossed the path of an auto accident involving Native Americans, injured and dying, with Jim believing it to be, perhaps, the most influential event in his life, reflected in his dark lyrics and poetry. The Doors, unlike other bands at the time, weren’t interested in being happy and peace and love. They were, as far as Jim was concerned, interested in finding meaning in the suffering, in the places one would prefer not to look, in the cracks through which life falls. That Morrison practiced what he preached came as surprise to no one, but his death at the old, old age of 27 did. Some consider him one of the most charismatic singers in rock, while others believe his antics reflected a spoiled child who thrived on attention. We didn’t know Jim. What we do know is that The Doors absolutely make minds flutter, our hearts yearn for what might have been had he lived, yet thankful for what he left behind. We miss ya, Jim. 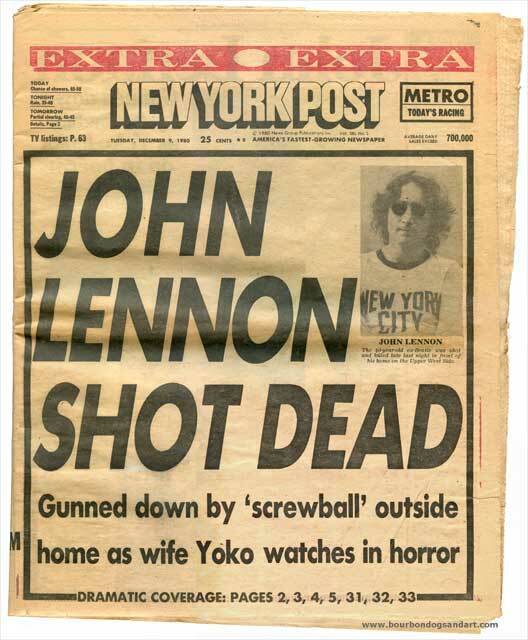 12.08: This gorgeous fall day in 1980 became, by its end, the darkest in rock history, when Mark David Chapman raised a .38 revolver to the back of John Lennon, fired five times, and took the life, in an instant, of one of the greatest singer/songwriters ever. Lennon lurched toward the reception area of his apartment building, the now unfortunately famous Dakota, collapsed and quietly bled to death. Chapman didn’t flee, instead removing his hat and coat, sitting upon the sidewalk, pulling out his recently-purchased copy of The Catcher in the Rye, and reading until the police showed up to arrest him. Asked by the Dakota’s doorman if he knew what he’d just done, Chapman responded, “Yes, I just shot John Lennon.” To this day, this is the one death we wholly wish we could go back in time to prevent. Lennon’s death, unlike those of so many of his overdosing ’60s compatriots, made no sense, whatsoever. Having just released, three weeks prior to his death, the monumental and breathtaking Double Fantasy album, Lennon seemed ready to retake the rock world, to show everyone why his voice needed to be heard yet again. Mark David Chapman’s insanity saw to it that we would never have this. We sincerely hope he’s never released from Attica prison. 12.08: A crazed gunman took the life of “Dimebag” Darrell Abbott on this day in 2004, during a Damageplan concert in Columbus, Ohio. Motivation for the murder spree, which also took the lives of three others that night, is still up in the air, with many believing the gunman angry about the breakup of Pantera, Dimebag’s former band, or angry at a perceived theft of songs by Dimebag, while the gunman’s own writings seem to suggest he thought Dimebag could read his thoughts. While the gunman’s spree ended with a police officer’s shotgun, Dimebag’s contributions to heavy metal will never end, with his thick, Texas-groove guitar work in both Pantera and Damageplan considered some of the best of the ’80s and ’90s.